Welcome to the Damask Divas October Blog Hop! Fall is in the air and we are featuring the Pathfinding paper pack – autumn colors galore! If you got here from Lilian’s blog, you are in the right place. You can always go to the Damask Divas blog site to see all of the inspiring projects – just click here. I made a 5×7 greeting card using the Pathfinding paper pack. I used the new Artfully Sent exclusive Close to my Heart Cricut cartridge to make the card base, envelope and envelope liner. I used my Cricut Explore and Design Space to Print then Cut the pumpkin, sentiment and leaves (these are from Artiste). If you don’t have the Explore you can just cut paper items in the usual way using Artiste and your Expression or E2 machine for the embellishments. If you are using your Expression or E2, set the card base size according to the booklet on page 39 and page 47 for the envelope and liner. If you are using the Explore, set the size for the card base to cut at 9.34″ wide by 11.31 height. Set the envelope and liner to cut at 10″ wide with 7″ height. This gives you a little extra room in the envelope for a thick card. 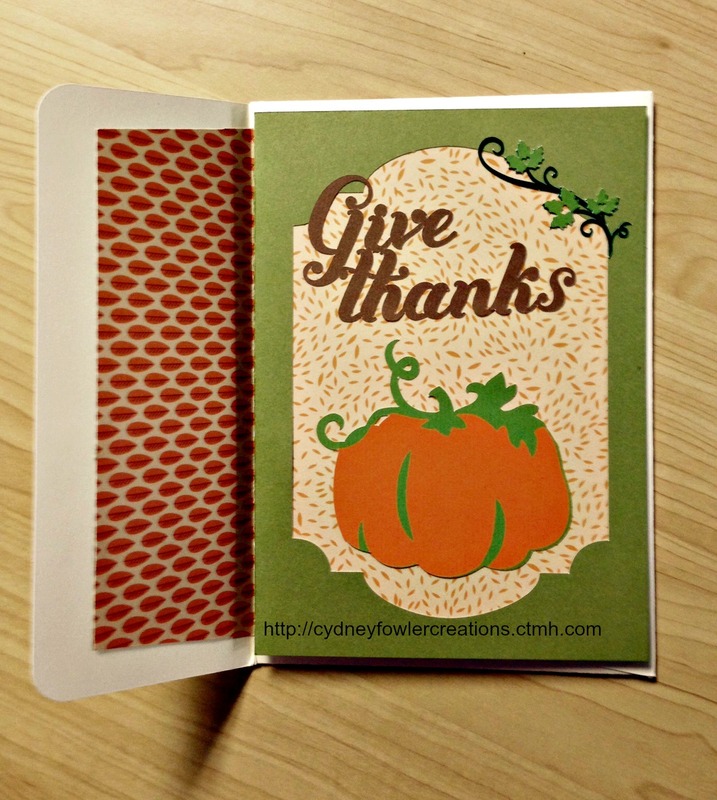 Give Thanks and Leaves – these are part of the Harvest Layout and the items are grouped together. #MB0171 is the number. To use just the Give Thanks and the leaves, ungroup them. Hide what you don’t need by clicking on the eye for each item you want to hide. For Print then Cut – change colors to suit your theme, flatten, select all, attach. To use the codes, make sure you put the # sign in front of the number. Insert images, make sure you are in all images. In the search box type the #number and hit enter. You should see a preview of the image. Click on the preview to insert the image. The image codes start with #M and the cartridge codes for the CTMH cartridges start with #S. This allows you to search for the cartridge image set in search in the same way as the images. It is a real time saver. You can purchase Close to my Heart products from me at http://cydneyfowlercreations.ctmh.com or from your own consultant. I hope you enjoyed my card and information on using the Cricut Explore. You can make this project with your legacy machines, but I am hooked on the new Explore and Design Space. Combined with our CTMH Cricut cartridges and CTMH papers it is amazing what you can do. I am the “end of the line” for this blog hop. If you want to start again, click on the link at the top of the page to return to the Damask Divas blog page. Thanks for joining us!